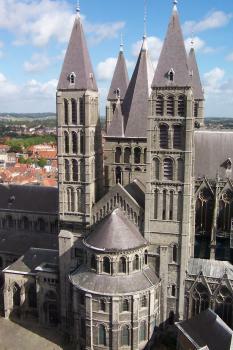 The Notre-Dame Cathedral in Tournai is seen as a precursor of the vast Gothic cathedrals, constructed in the school that developed north of the Seine. 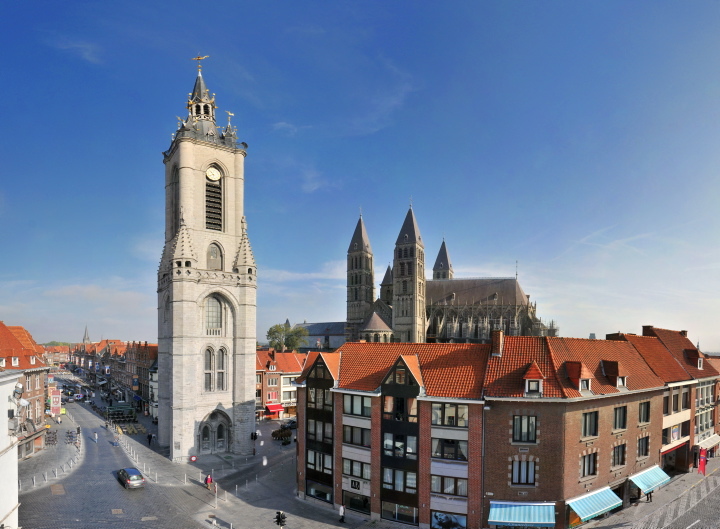 The building of the Cathedral of Tournai lasted from 1146 until 1325. 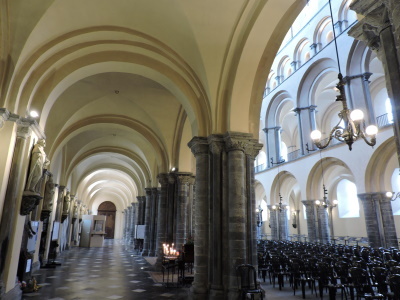 At first, a Romanesque cathedral was built because Tournai had become seat of a bishopry. The main nave of the present cathedral was constructed during that period. Later on, the architects became more influenced by the then fashionable Gothic style. This can be seen in the 5 towers and the choir. Election Day in Belgium. While listening to my car radio I noticed some remarkable differences between the voting here and in my home country Holland. For example: you can only vote between 8 am and 1 pm on Sunday (you get 2 hours extra when your voting station uses computers). This obviously leads to long queues (1-2 hours!) at some places, even more so because voting is obligatory. Back to the subject of this website: I was a bit unsure of my goal of today, the Cathedral of Tournai. Various websites state that it is undergoing repair works, for a very long time. But the cathedral has reopened for visitors, though construction works are still going on. The Gothic part is still hidden beneath covers and behind bars. My wife and I visited here in August 2017. 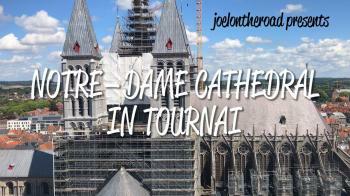 The cathedral is currently undergoing heavy renovation, both inside and out. I would estimate something like half of the exterior is covered in scaffolding, and less than a third of the interior is available for viewing. However, you can still see the impressive towers and the portico at one end, as well as the exposed remains of earlier churches inside. With that in mind, Tournai is actually a beautiful little town for a visit, particularly on a sunny summer afternoon like we had. A great lunch on the square, a climb of the belfry (part of the separate Belfries of Belgium and France listing) from where you get a fantastic view of the cathedral, then a wander around the cathedral. The cathedral was pretty much closed for restorations when I visited and will be for a couple more years. When I arrive, I find that there is a small door open on the opposite side of the cathedral to where I’ve approached from. I go through and leave my bag just inside the entrance. I am in a chapel that, at first, seems quite large and I start to think that maybe I will be able to see more than I thought. It’s only when I go through a little passageway to the main section of the church that I realise what a small proportion of the building the chapel is. Here is where all the work is happening. The passageway is covered with scaffolding and boards and, by peeking through some cracks, I can see up to the ceiling and across to some of the windows. There’s an enormous space in there that, when open, must be quite breathtaking. It’s a pity that they’ve decided to hide it from view rather than give visitors an opportunity to see the restoration work that’s going on. Huge cathedral but still covered with scaffoldings. This will last until 2017 - major works, although minor works will be carried out until 2025 (?). Currently (July 2015) it is not possible to visit main nave but at least you may see some views of archeological findings from different stages of monument construction (even from the time when there were Gallo-Roman buildings). 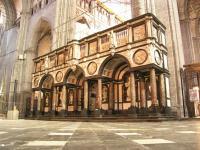 I visited the cathedral in Tournai in 2011 and was really impressed by the town in general. Clean, not so many tourists when I visited, quiet, lots of bars and restaurants. The Cathedral is really a highlight together with the nearby belfry (also a WHS). 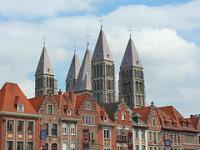 The Cathedral of Tournai is one of the most representative and beautiful example of the Gothic Art. Its most ancient part has been built during the 12th century. The 36 meters high and 134 meters long Cathedral has been renovated after suffering great damages and is one of the jewels of Belgian Heritage. While visiting the city of Tournai, don't forgot to give a look to the belfry of the city which belong to the list of Belfries of Belgium and France, registered on the WHS list. For my birthday some of my friends joined me in visiting the Cathedral in Tournai. We went by train. Tournai is easily reachable from Brussels though we had to do some transfers from my place before we could get there. From the station we first went to the Tour Henri VIII. Tournai is the only Belgian city ever to have been conquered by the English and this tower is one of the sole survivors of this period. Also nearby is the Pont Des trous which is also a nice sight. We went on to the Grand Place. And it struck me how beautifull this market was. You got a great view on the world heritage belfry. I'm also guessing something was going on that day as most of the statues we came across were dressed up. As probably stated before, the belfry is definitly worth it. 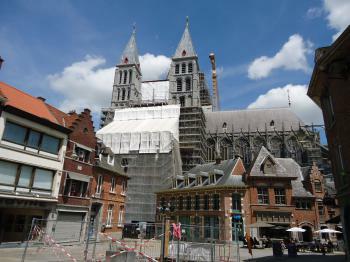 Being the oldest in Belgium, being nicely restored and offering a beautifull view to the cathedral. After visiting 19 belfries, this one comes out as one of the best for the moment. Onto the cathedral, which is undergoing restoration. Some parts are entirely wrapped in scaffolding. Especially the nave's exterior is nicely tucked in. The size of the building is puzzling to me. I expected the towers to be somewhat bigger, but the building itself is quite big. I especially love the purple colour of the roofs. The gothic choir inside was entirely sealed up and filled to the brim with scaffolding. Some parts of the floor in the cathedral are opened up, for archeological research I presume. The nave itself was quite beautifull, especially the rosary window and the old statues outside at the entrance. The part I liked the most in the cathedral was the rood screen. I found it to be quite beautifull. For a measely 2 EUR you can visit the treasury, which holds some very nice treasures. Definitly worth it's money. I can recommend a visit to this (one of the oldest religious) building in Belgium. I visited the cathedral on July 31st, 2008. It still resembles a building site, both outside and inside. The main body of the nave is cordoned off and there is clearly much restoration and repair work to be done. Saying that, you still get a sense of the grandeur of this wonderful building. The Grand Place is lively and bustling with a huge choice of places to eat or have a drink. An English concert band from a school in Essex were playing when we strolled around. The cathedral is right in the centre of town and can be seen from most places. It is a fine example of Romanesque architecture. I was impressed by the design it is not as lavish as many other European cathedrals, but it is still quite striking. Unfortunately it was closed when I visited so I did not get a chance to look inside, and see the apparently impressive sculptures. There were some renovations continuing on the outside but it seems that the major restoration is nearing completion after the towers were hit by a tornado! in 1999. Of the façade the Porte Mantile archway was impressive if a little weather/ pollution worn. The town of Tournai was quite pretty and very quiet. At the end of la Grand Place about fifty metres from the cathedral is the Belfry which is part of the Belfries of Belgium and France WHS. This was excellent; the exhibits inside give a great introduction to what these towers represent, it also gives the best views of the cathedral (see picture). Tournai is easy to reach from Brussels 1h or Lille 25min, and is close to two more WHS Spieness Flint mines and Le Canal du Centre. It is worth a trip if you are in the area. 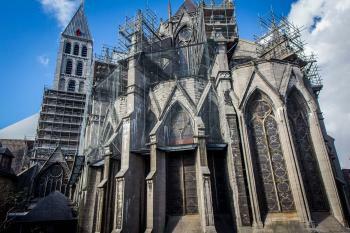 Undergoing Restoration or Repair: The interior of the nave at Tournai Cathedral is undergoing restoration and is covered in scaffolding, until at least 2017.